Never used pre-shrunk tissue for anything but flat surfaces, Alf...specifically lightly constructed tail surfaces. Concern has always been over warps...that's the entire point...to prevent them. Normally I need all the help shrinking tissue can offer...wish it was like old Monokote...but it isn't, obviously. But sometimes I find myself working against that shrink-power of tissue...trying to avoid it's potentially destructive force. Pre-shrunk tissue is on the shrink-frame. Glustick that flat model framework (horizontal stab/vertical stab...whatever)...then lay it on the taught pre-shrunk tissue. Use light finger pressure to ascertain good adherence. Give it a little time to set up...then cut it out with sharp Xacto...leave an overlap to finish things off. Done. No need to spritz it again...no warps...no pain. I prefer to pre-shrink and attach the model framework while the prepared tissue is still on the "picture frame." I read about this on the forum and can't really picture how it's done, particularly for anything that isn't flat. Wings were covered in the "standard" fashion...I don't recall if it was wet or dry however...but I'm certain that I pinned things down while the tissue "cured." Model has a 22"ws...and is lightly built overall...1/16" sq stock. As for the tail and pre-shrinking...what it amounts to...imo...is a consideration of the strength of the model's framework, i.e., will the tissue (on the model frame) shrink so severely as to deform the model? In other words...do you want a potato chip (banana) or a covered and aligned framework? That's a no-brainer. There are other ways to deal with this problem...like using alcohol to spritz the tissue...the idea being that it will evaporate more quickly...with a resultant less shrinkage than using water. Or a water/alcohol solution, etc. I prefer to pre-shrink and attach the model framework while the prepared tissue is still on the "picture frame." I figure that I can't pull it tighter than that freehand. At any rate...the idea is to NOT distort the model's delicate framework while shrinking the tissue. Sometimes it comes down to a compromise. See...learning diplomacy...the give and take. Those little sticks look up at you as if to say, "Have some respect!" You respond, "All right, I will...and then you'll behave, right?" Dying your own tissue...haven't ever tried that...but as an alternative...lots of folk color their tissue using colored pencils or pastel chalks. Never really tried that either...but have seen the results...looks good...but sounds messy. The wings look great!! How were they covered? Why pre-shrink tissue if it is not going to be shrunk after application? Does the tissue gain strength by being shrunk? Is it then easier to apply? This is the part that I don't get. Different subject...but I've been searching the forums for discussions about dying tissue. Over all, the comments seem to be somewhat negative to the idea regardless of method. There's no doubt that tissue certainly adds to the structural integrity of a frame...but sometimes it borders on the extreme...in which case one ends up with the proverbial banana effect...especially on those lightly constructed tail surfaces. That's where...imo...pre-shrunk tissue is really helpful. We're still looking for the aesthetics...just not the banana. The tail surfaces on my Pilatus Porter are of 1/16" sq stripwood...covered with pre-shrunk tissue that was NOT re-spritzed when applied. Stayed straight and true. Best of fortune with your peanut, Alf. Thanks, Neal! I suppose I wasn't seeing the big picture. I've tended to see shrinking as a means of tightening up the tissue (or silkspan for CL), mostly for appearance sake. I've heard that shrunken tissue adds a certain structural strength. If that is the case, then perhaps pre-shrink is used to reduce the tightening qualities prior to covering when the intent is to shrink again after covering. Otherwise, if not shrinking after covering, what is the point of pre-shrinking? You've got the idea, Alf...intent is to reduce the contractability of tissue first...before it's applied to that delicate/flimsy model framework. I use an ordinary old picture frame...attach tissue using same method as you would ordinarily on the model itself. Spritz...when dry and taught...you have the choice of cutting it out of the frame and applying to model surface (usually flat surfaces work best) or...attaching model surface while tissue is still attached to shrinking framework...then cut it out, trim and fix tissue edges. Presto...that's it. If you spritz it again...shrinkage will be minimal and ideally lessen the chance of warping...but not really necessary at this point. 1/16" stripwood tail surfaces always have a real danger when shrinking...and when one gets into 1/32" stripwood...well, good luck. That's when pre-shinking becomes a necessity. Just my approach to the problem, Alf...I always pin things down while the tissue dries. I thought I would try out a Peanut model and have been reading up on building tips. I've never tried pre-shrinking tissue and have a question or two. I don't think I understand what is being done here. Is the object to allow the tissue to shrink before it is attached and then shrunk again, thereby avoiding or lessening the chance of warps? How is the tissue secured to the shrinking frame? Cover the fuselage dry, shrink with water and seal/finish (I use nitrate dope). For difficult compound curves apply the tissue wet. Much easier with Isaki, almost impossible, at least for me, with domestic tissue but I do sometimes manage. It falls apart in my hands too easily. Assuming the wing is cambered cover it dry and shrink with water. I shrink and dry panels one at a time, e.g. 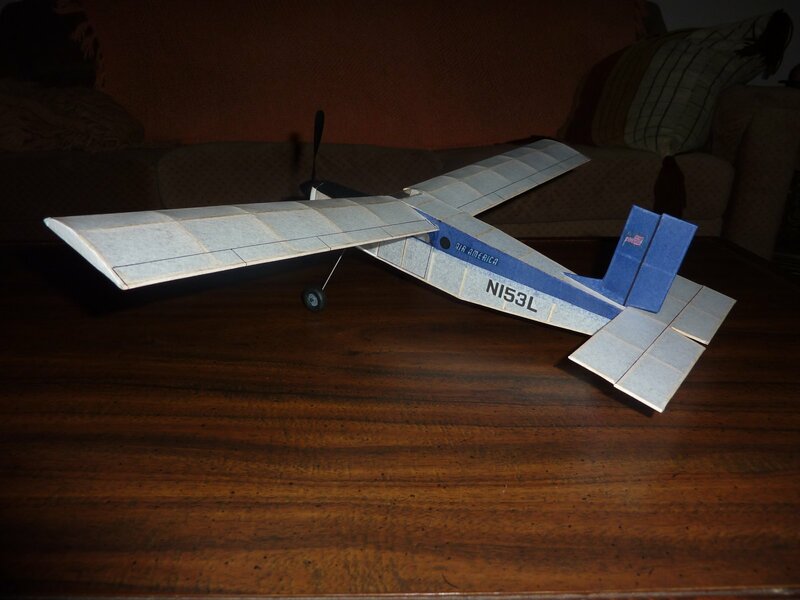 a 3 panel wing gets the level center panel shrunk and dried then the port panel (with dihedral), then the starboard panel. Each panel is shimmed underneath and weighted down on a flat surface around the perimeter while drying to hold flat or set the intended twist as for wash out. After sealing/finish is applied I also weight it down on the board to hold the shape until COMPLETELY dry. For empennage I have had best luck preshrinking on a frame, taped over a window cut out of foam laminated poster board. After applying sealing/finish shim and weight as for the wing to hold flat while drying. I have had no luck with E-Z dope but at least a few here have experimented with it and sometime gotten acceptable results. It is certainly one the least smelly or toxic alternatives. If you are unable to prevent warping on fuselage and wings try preshrinking the tissue as for the empennage. The difficult thing about preshrinking is getting a smooth surface, detrimental the looks of display model. Usually I shrink with EzDope thinned to 50/50 dope to water, very fine atomizer. I have used 40/40/20 Ezdope,water,alcohol. I try to use the smallest amount necessary on these little guys. I actually have 3.built waiting for covering,then its back to 20ish inch WS again. What do you use to shrink the tissue? Some use Isopropyl Alcohol to shrink tissue, seems to shrink tight without causing too much warping if any. Depends on application. Many others will preshrink the tissue on a frame prior to covering. When it comes to the empennage no shrinking at all, just stuck to the framework. 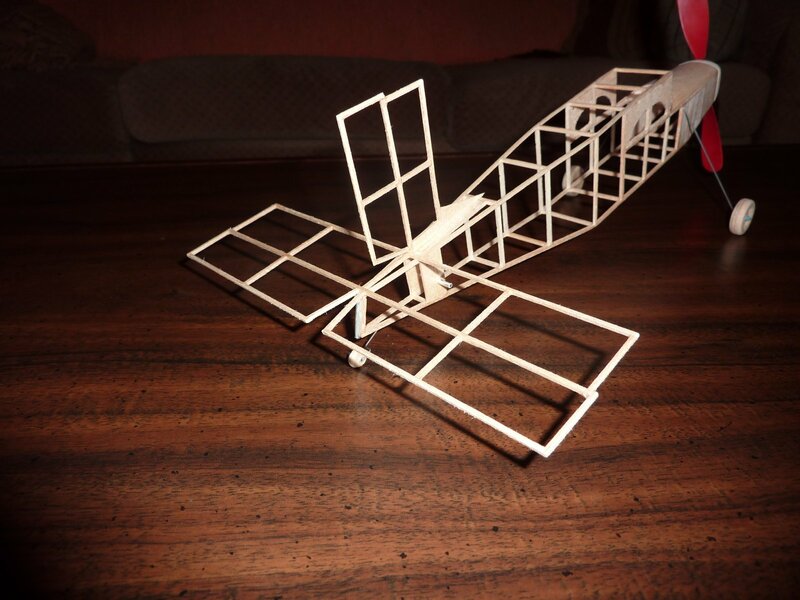 I have used the Alcohol pretty successful on the peanut scale models I've made.